Our 3 year Anniversary was this past week and we knew exactly where we wanted to go to spend it. The newly opened Del Frisco's Grille on Palm Beach Island. Del Frisco's is located on Royal Poinciana Drive, in the same strip as the Palm Beach Grill. I have never been to a Del Frisco's before as they have multiple locations around the country. Del Frisco's is best known for their exceptional cuts of meat, but in keep in mind this is Del Frisco's Grille. Gille meaning it is more of a casual, trendy, American bar and grill. Del Frisco's Grille offers hand crafted cocktails, a modern atmosphere, and a menu that intrigues all the senses. Brandt and I arrived to Del Frisco's a little early so that we could enjoy a drink at the bar before we sat down. I ordered one of their signature concoctions, the Morning After. It had Pearl cocunut vodka, coconut water, lemon sour, and a dash of sprite. Very refreshing. To make it a little less sweet, you can substitute the sprite for soda water. When we were seated we wanted to pop our bottle of wine that we brought. Del Frisco's has a 25 dollar corkage fee. Pretty much the norm these days. 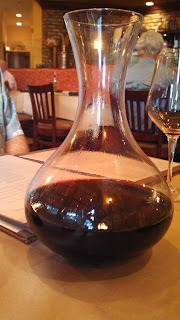 If you do not bring your own bottle, Del Frisco's has quite an extensive wine list and you can see their wine selections stored gorgeously near the front of the restaurant. The Sommelier was fabulous! Our cork was crumbling due to the age of the wine, but she managed to save it!! Lets give a shout out to her..WOOHOO! All of the appetizers sound amazing. I can't wait to go back and experience the other starters we did not get a chance to try. We started with one of their signature appetizers, Ahi Tacos. Tuna tartare, avocado, spicy citrus mayo in little taco shells. These were good, however I felt the guacamole overpowered the dish and the main star, the tuna. Next we had the Wild Mushroom flatbread. Wild mushrooms, fontina cheese, caramelized onions, and arugula. One of my favorite dishes from the night. I would definitely come back for this. 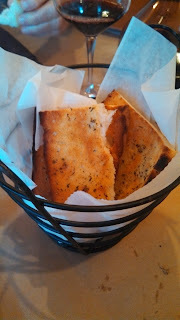 The crust was soft, unlike other flatbreads you get that are thin and crispy. This one you actually could fold! LOVED! 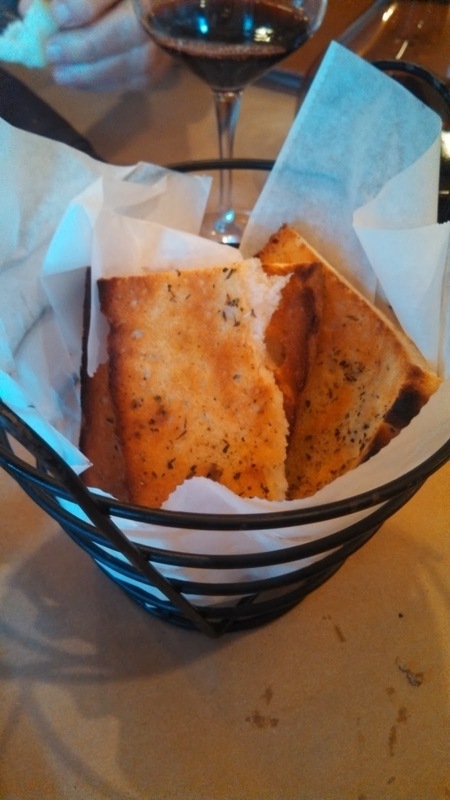 We couldn't help ourselves and ordered one more appetizer. Our waiter raved about the crabcake and it is apparently on every menu across the country. No fillers in this crabcake, just pure lump crab. Since Del Frisco's is known for their steaks, we decided to share one. We shared the 16 oz. prime bone-in filet of ribeye. We ordered it medium rare and the steak was cooked to perfection. Full of flavor! The steak comes with a potato souffle which I had one bite and that was enough. The potato was dry and the bacon in it overpowered the potato. The steak however was completely on point. All the sides are a la carte, so we ordered the first thing that caught my eye. Truffle mac and cheese. AHHMAZING! Just take me to the back of the kitchen, give me a spoon and I could of ate the whole pot. So good, you have to try. For dessert, we had their chocolate cake that was a hot, ooey, gooey chocolate cake and served with raspberry sauce and ice cream. As you may know, my husband is a chocoholic. He loved this dessert and ate every last bite. He was in love. If you like chocolate, this one is for you. So by this time that night we were stuffed. Bring the wheelbarrow out and wheel us out!! We had a great night. The atmosphere is fun, colorful, modern, trendy, and a little loud. I know Del Frisco's is going to be the newest hottest spot on the island. The bar was popping even when we left. Many people eating and drinking at the bar. A great spot for happy hour for sure. For your next night out, try Del Frisco's, you are gonna have some fun! Next to one of my favorite restaurants, Too Bizaare, is Casa Mia. 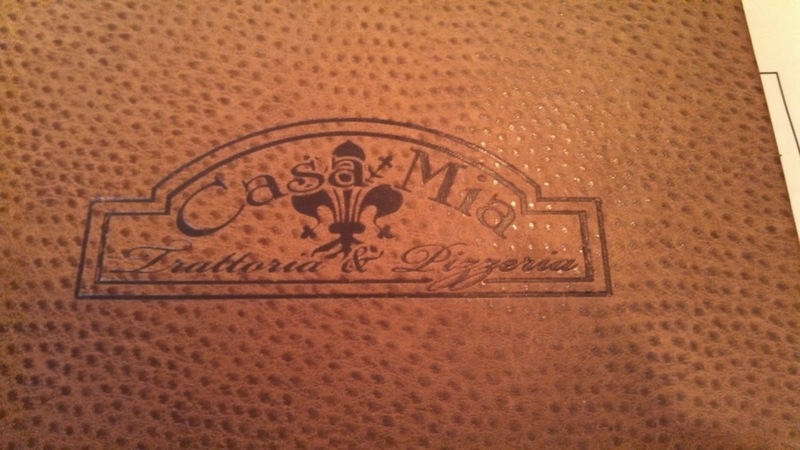 I have been wanting to try Casa Mia for quite some time, and boy do I wish I would have tried it sooner. This cute, cozy restaurant serves up some bold Italian flavors. As you walk in, you are surprised to see such a large stone fired oven, or at least I was surprised. The atmosphere is classic and quaint, but the smell when you walk in the door makes you want to try everything on the menu. In their coal fired oven, they not only prepare pizza, but also bake homemade bread for you to nibble on. The bread was crisp and crunchy. We shared a few appetizers, the Carpaccio di Manzo and the Boscioloa Pizza. The Carpaccio was thinly sliced beef, arugula, Dijon mustard, and shaved parmigiano. I thought the Dijon mustard could be omitted as it was a little overpowering on such a delicate appetizer. 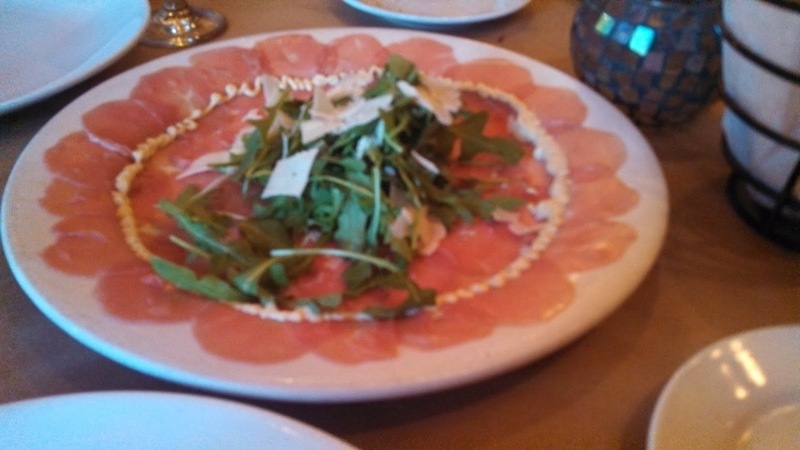 The arugula and freshly shaved parmesan with the carpaccio is always light and refreshing. The Boscaiola Pizza was my favorite thing all night. 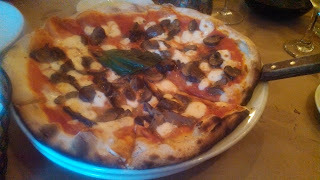 The pizza had tomato, mozzarella, wild mushrooms, and truffle oil. Truffle oil is my new obsession. Loved everything about this pizza and would definitely come back just for a few pies. 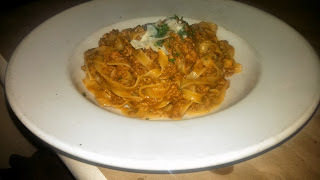 For my main dish, I had the Fettuccine alla Bolognese. 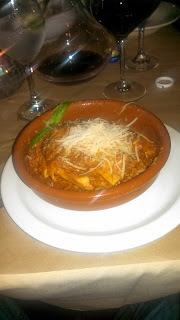 As you know I always like to try a restaurants Bolognese sauce as I believe that really says alot about the restaurant. Casa Mia makes home made Fettuccine and the sauce was full of flavor. The bolognese was chunky and even a little creamier then most bolognese I have tried. Some places prepare with multiple meats, such as pork and veal, but I tasted strictly beef. Either way, it had the flavor I was looking for. I would recommend to all of you who are just like me that crave traditional dishes. Brand had the Lasagna Pasticciata dello Chef. Very similar to the flavors in my dish as it has the Bolognese sauce, fresh mozzarella and Béchamel sauce. Great dish. The sauce is not saucy, very meaty. If you are a saucy person, this might not be the one for you. My Dad had the Linguine alle Vongole or what I call Linguine with white clam sauce. 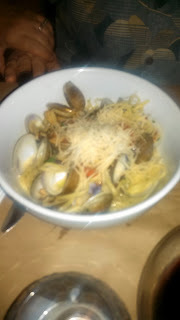 The clams were HUGE! My dad always asks for extra garlic, so he got what he asked for and loved it!! Delicious! 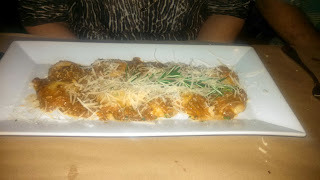 My mom tried one of the speicals that night which was Ravioli with Braised pork. Probably the least favorite dish of the night. The bolognese sauce was much tastier. The braised pork overpowered the dish and again very meaty where it almost needed a little more sauce. With so much meat, it almost make the dish dry. 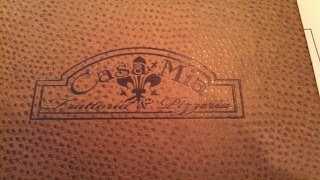 Overall we had a great night at Casa Mia. I would go back again and I highly recommend the pizza's. 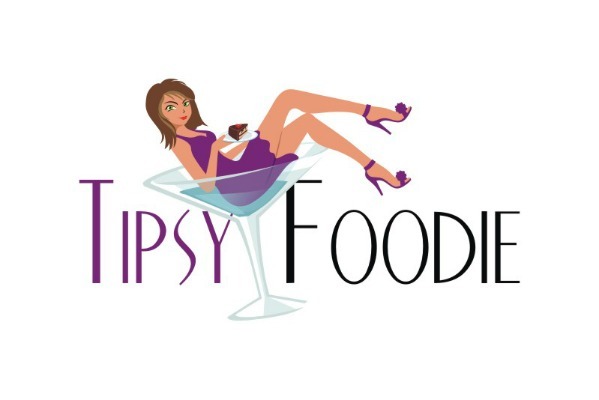 I cant wait to return and try a few more of their creations. Right now Casa Mia is slightly hidden as they are doing construction right next to it due to the opening of Fresh Market. So do not be discouraged by all the construction surrounding the restaurant.